Chancellor Jim Schmidt did not need more stress in his life. He had been handed budget cuts in 26 of his past 30 years. But this was different. The University of Wisconsin – Eau Claire had an operating budget of $95 million. This was a budget that had seen a heavy dose of cuts in recent years. Now they would have to cut $15 million more. They were beyond cutting to the bone. Good people, long-tenured people, would have to go. Along with programs that had been with the institution for decades. This meant they had to think different. So Chancellor Schmidt decided to do something bold and radical. He decided to restructure. 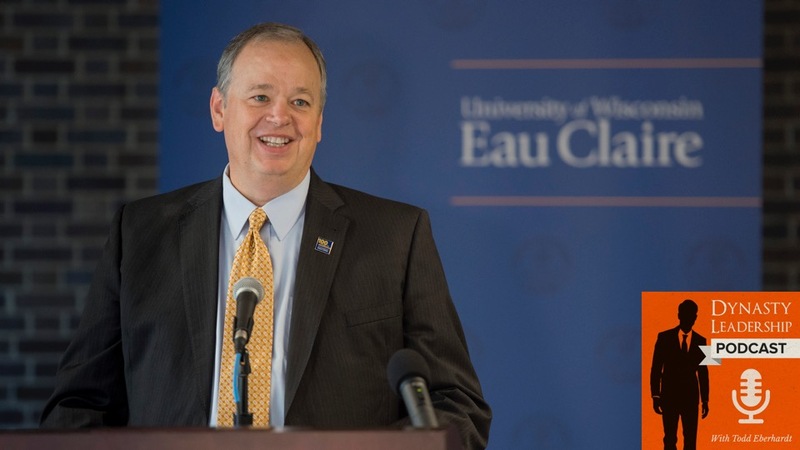 In this episode of Dynasty Leadership Podcast, Chancellor Jim Schmidt, head of University of Wisconsin – Eau Claire, shares the gut-wrenching decisions made when there were no good answers. He reveals his process for protecting what was important, challenging the status quo, and working to restructure a major state university moving forward. His story parallels a few great company leaders that have done the same. If you have some tough decisions to make that will affect a lot of people or if you want to build a true following, then this podcast is for you. [1:25] Who is Chancellor Jim Schmidt and how did he get started in his career? [2:05] Of the 30 years Chancellor Jim has worked in academia, he had to cut the budget 26 times. [3:05] Across-the-board cuts are for lazy administrators. It’s viewed as ‘fair,’ but it really isn’t. [4:35] When it comes to budget cuts, how does Chancellor Jim approach this? [10:45] Remember, you’re only as effective as your people and if your people are worried about their job security, things aren’t going to get done as quickly. [11:50] How can you be transparent with your team when facing budget cuts? [14:25] Once your team is aware of the budget cuts, then you need to rally them towards a common goal and the university’s values. [20:35] When you’ve established what key areas are vital for your students/customers, then it’s time to get your team together to start brainstorming on the best course of action. [25:20] As a Chancellor, it’s Jim’s responsibility to give the students the best experience possible. If you make across-the-board budget cuts, their experience will suffer. [27:55] Chancellor Jim told his team to reject the notion that you gotta ‘do more with less.’ You can’t do that to your customers because then your quality will suffer. [34:00] Many of Chancellor Jim’s staff were willing to do more with less because they were used to that status quo. He had to tell them to stop because it will only lead to them being burned out. [35:30] The university has had four years’ worth of increased student enrollment despite making these budget cuts. [37:45] As a leader, you have to be open to having those tough conversations and you need to be available for your people. [39:05] Chancellor Jim does a quick recap. [41:40] What mistakes did Chancellor Jim make along the way that he wishes he did a bit differently?